We are really happy to share with you this emotive day, Algalon realm’s 4th anniversary as the first and truly Progressive WotLK realm. We want to thank you for making Dalaran your home and being part of our community, it is thanks to you, the players, that we have been able to show what the devoted work can result in. It is not the number of staff but the knowledge and passion for the Wrath of the Lich King behind our individuals that sets us apart. Thanks to every one of you, we have been able to prove that progressing through WotLK is one of the most desired experiences, and we have made it possible for everyone that starts with us, no matter when they find us – they can enjoy our eternally progressive WoTLK system. We started a new era, we renewed content no longer active, we exalted the importance of the journey and the little details, and with your support and our love to this expansion, we raised once again the magical capital of Azeroth: Dalaran. It has been a truly learning experience, we came from nowhere with our ideas, but alongside our enthusiasm and effort, your constant support and constructive criticism made us keep pushing our work and keep our feet on the ground so we could continue our quest to perfection. We will continue offering to you our best, stand up for the ideals that made us create Dalaran, keep our essence in everything we embark as we have been done since Dalaran was created 5 years ago back in 2013. This 2018 comes with a lot of activity, we hope you enjoy each one of our new endeavours, they are for you, our citizens, future and past players that sets their hearthstone in our magical kingdom. We hear your suggestions and we are currently discussing about the most popular and relevant one – stay tuned to the news. For this week of celebration and coinciding with the Lunar Festival seasonal event, we have included in our Vote Shop: Dalaran Fireworks, for just 1 Vote or Donation Point. Enjoy them! May the sparkle guide your path. The Argent Tournament is an event located in the north-east corner of Icecrown, just north of Sindragosa’s Fall. It involves a number of quests, many of which focus on mounted combat – players riding vehicles and simulating jousting. The quest rewards are various Seals, which can be used to purchase weapons, tabards, non-combat pets, and even mounts. The Horde’s main assistants and guides in the Tournament are the Sunreavers, while the Alliance is being guided by the Silver Covenant. To prevent not-so-honorable combat from happening, players in the Argent Tournament Grounds are affected by Armisticewhich prevents them from fighting members of the opposite faction, unless during a mounted duel. How do I fight in the Tournament? Joining the ranks of the fighters in the Tournament is very easy. All one needs to do is go the Argent Tournament Grounds in Icecrown, enter the Argent Tent, and talk to Justicar Mariel Trueheart. She will direct you to either The Sunreavers if you are member of the Horde, or The Silver Covenant if you belong to the Alliance. She will also send you to the Blasbolt brothers, who are two goblins responsible for the building of the Coliseum. From there on, your factions will direct you to the appropriate quests. Jousting is simple to start and hard to master. To begin you only need to pick a Lance from your faction’s tent (or automatically obtain one from any of the quests), and then mount on one of the stabled mounts outside. And you are all set! Just keep in mind that you can only ride mounts of the factions you have become Champion with, and your own home faction. Thrust : Melee, 3,250 damage. On its own cooldown. Shield- Breaker : 5-30 yards, 2,000 damage, removes 1 stack of Defend. Charge : 5-25 yards, 8,500 damage, removes 1 stack of Defend. Defend : 30% damage reduction, stacks up to 3 times. Refresh Mount : Heals your mount completely. Duel : Challenges another player to a duel. When jousting, you will need a strategy of some sort in order to win. One of the more basic ones is stacking your Defend 3 times before the duel, then keeping your enemy at a distance, toss a Shield-Breaker whenever possible to reduce his or her Defend. Remember to keep yours up! When the enemy is vulnerable, Charge and Thrust them, and then re-establish the distance, using Shield-Breaker again. The Argent Tournament quests and rewards work with an alternative currency -Seals. All players start as Aspirants with their race and have quests available with only them. Quests at this level award Aspirant seall. Total of 15 Aspirant’s Seals are required to advance to the next rank – Valiant. Quests now awardValiant’s seal l, and you need total of 25 of those to advance to the final rank in the Tournament – Champion. Daily quests at this level award Champion’s seal which are used to purchase rewards from one of the Quartermasters located in your faction’s Tent. After becoming a Champion with your home faction, you can choose another faction to work with. Fortunately, when taking a second faction, you no longer need to go through the basic Aspirant training – you start as a Valiant. The Argent Tournament : Justicar Mariel Trueheart will simply send you to talk to Arcanist Taelis/Magister Elien Sunhollow. Congratulations, you are now an Aspirant! 1. Mastery of Melee , Mastery of the Shield-Breaker , Mastery of the Charge : The three quests are offered by NPCs of your race in your faction’s tent. You will need to practice Thrust on Melee Targets , Shield-Breaker on Ranged Targets , and Shield-Breaker + Charge on Charge Targets . 2. Learning the Reins : Practice your Thrust, Shield-Breaker and Charge abilities against the Target Dummies. Again! 3. Training in the Field : Slay (almost) any 8 Scourge units in Icecrown. 4 A Worthy Weapon : Collect 4x Winter Hyacint found around the dam between Icecrown and Crystalsong Forest. Offer the Hyacints to the Maiden of Drak’Mar in the North-Eastern corner of Dragonblight. | A Blade Fit For A Champion : Apply Warts-B-Gone Lip Balm before kissing an unknown number of Lake Frogs , hoping that one of them will turn out to be the Maiden of Ashwood Lake . Remember to apply the balm before each kiss, or you may and will get Warts !! | The Edge of Winter : Slay Lord Everblaze for hisEverburning Ember , before heading to the Maiden of Winter’s Breath Lake and freeing her from her icy prison. Note: You can only get one of the “blade” quest each day: A Blade Fit For A Champion, A Worthy Weapon, or The Edge of Winter. Daily Rewards: Completing all three daily quests awards 5x Aspirant’s Seal and 750 Reputation with The Silver Covenant/The Sunreavers. 5. Up To The Challenge : Collect 15x Aspirant’s Seal to be allowed to fight for the rank of Valiant. 6. The Aspirant’s Challenge : Talk to Squire David in order to summon, challenge and defeat an Argent Valiant. 7. A Valiant of… : Talk to your race’s representative in your faction’s tent to become a Valiant of your main city. Now the Valiant’s quests for your race will be unlocked. 1. The Valiant’s Charge :Present 25x Valiant’s Seal to your race’s representative in your faction’s tent to be be allowed to become Champion. 2. A Blade Fit For A Champion| A Worthy Weapon | The Edge of Winter. Note: You can only get one of the “blade” quest each day: A Blade Fit For A Champion, A Worthy Weapon, or The Edge of Winter. 4. At Enemy’s Gates : Slay 15 Boneguard Footmen , 10 Boneguard Scouts , and 3 Boneguard Lieutenantswhile using one of the mounts in the Argent Forward Camp in the Court of Bones near Corp’rethar. 5. 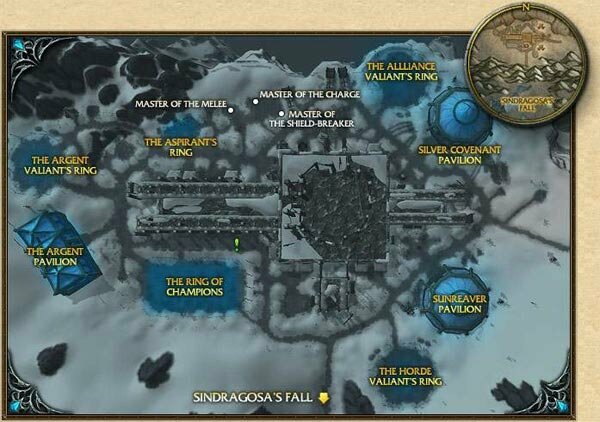 The Grand Melee : Defeat 3 Valiants in either of the Valiant’s Rings in the Argent Tournament Grounds. Note that you will not be able to defeat the same race for 5 minutes. Each valiant count also as criteria for the achievement Lance a Lot . 6. The Valiant’s Challenge : Talk to Squire Danny to summon, challenge and defeat an Argent Champion . 7. A Champion Rises : Talk to Justicar Mariel Trueheart to receive 10x Champion’s Seal and an Argent Squire /Argent Gruntling. Once you are a Champion with your city, you will have the opportunity to become a Champion for another one of your faction and also the daily champion’s quest will be unlocked in the Argent Pavilion. 1. Eadric the Pure : Talk to Eadric the Pure to unlock all of the Champion’s daily quests. 2. Taking Battle To The Enemy : The final version of your Field Training. Slay 15 Scourge units in Icecrown and/or their agents. 3. Among the Champions : Defeat 4 Champions in the Ring of Champions. 4. Battle Before The Citadel : Slay a 3 Boneguard Commander in the Court of Bones. 5. Threat From Above : Slay Chillmaw and her 3 Cultist Bombardiers. Daily Rewards: Completing all 4 daily quests awards 5x Champion’s Seal, and up to 4 Champion’s Writs , which can be used to purchase Commendations worth 250 Reputation with any city you have become Champion with. Alternatively you can choose to receive a Champion’s Purse with 10g and a chance for a Champion’s Seal inside, instead of the Writ. You also get 250 Reputation with the Argent Crusade andThe Silver Covenant/The Sunreavers. Incredible! You’ve managed to surpass all expectations and become a Champion for all the cities in your faction. As a “Crusader”, you have reached the highest rank here at the Argent Tournament. You will need the Exalted Champion of the Alliance /Horde and The Argent Crusade for it. Breakfast of champions – Gormok Wants his Snobolds – What do you feed a Yeti, Anyway? All of these reward 1 Champion’s Seal per quest, so 3 extra seals per day once you complete this achievement. 1. The Black Knight of Westfall / Silverpine : Obtain the Dusty Journal in either Westfall or Silverpine Forest. 2. The Seer’s Crystal : Obtain a See’rs Crystal from Unbound Seers in Crystalsong Forest. 3. The Stories Dead Men Tell : Use the Seer’s Crystal near Connall’s Grave, Lorien’s Grave and Sir Wendell’s Grave. 5. The Black Knight’s Orders : Use Enchanted Bridle to take control over the Black Knight’s Gryphon . Fly to whever it takes you and obtain Stolen Tournament Invitation and Black Knight’s Orders . Note: In order to proceed further ahead with the chain, you will need to complete A Champion Rises first. 7. The Black Knight’s Curse : Investigate the Black Knight’s Grave and kill the assasin. 8. The Black Knight’s Fate : Obtain from Doctor Kholer the Doctor Kohler’s Orders at Deathspeaker’s Watch. We seek the Legends of Ulduar, the same who destroyed the twilight threat that Sartharion sheltered inside the Obsidian Sanctum, purged the scourge necropolis of Naxxramas by defeating the Archlich Kel’Thuzad, confronted Malygos the Spellweaver in the Eye of Eternity and are dare enter the gates of the grandest and most majestic prison ever built in Azeroth. Navigating this subterranean realm of ice and stone, filled with ornate hallways, stairs and balconies, will require all your knowledge and skill if you wish to become a Legend. The abilities and willpower you’ve shown during training will be tested to their limits here, since it is this time not about being a Celestial defender or Death’s demise, it is about becoming the Legend that everyone in Dalaran will remember. This is your chance to show what you’ve gleamed of the Titan city’s strengths and weaknesses and to prove you are ready to face the challenges of the Argent Tournament. The most valiant of you will earn their place as Legends of Ulduar. 1) Consult with your guildmates before applying, motivate them, organize the roster and decide the streamer. 2) Decide in which mode you want to participate – 10 man and/or 25 man. Subject: The Legends of Dalaran – Speed/Achievement challenge. (Your character name), officer/guild master (raid leader if PUG) of the guild: (Guild name or PUG name). We sign in 10/25 man mode, accepting the rules of participation. Our streamer will be: (Name of the streamer/streamers), this is his/her stream link: (stream link). The raid leader will be: (Name of the raid leader/possible substitute). We will raid at: (raiding date and time). 4) Wait to the date of the challenge. Can we participate without streamer or video recorder? – That is unfortunately impossible, we want the entire raid to be streamed, recorded and sent to us. Can a group participate if not all participants hail from the same guild? – Yes it can, there can be Picked up Groups. But their members will not be able to participate with their own guild as well for the entire duration of the Tier 8 – Ulduar Tournament (Speed run/achievement run). – You have to decide the name of your group and specify it in the application in the Guild name slot as Pug Group. Example: PUG group: The archmages with arthritis. Can my guild/group participate in 10 and 25 man? – Yes, but you can only participate in each mode once. Can I participate with different PuG groups or guilds on several stages or challenges from the same tier? – Not with the same character, if you choose one group or guild, you will be able to only participate with them during the whole Tournament correspondant to the current tier. Howerver, you can participate with one character with your guild, and use an alter to join a pug group, for example. This way you will be allowed to receive the rewards with both of them even if they belong to the same account. There is no limit on how many groups you may join but remember, you must use different characters. What if we are missing people from our roster when the run starts? – As Guild: You can bring ONLY guildmates as a replacement to your tournament roster. – As PuG group: You can pick up any new players that are not participating already. We’d advise that you include backup players in the roster just in case. Can my group or guild participate in the Tournament after the Speed Challenge applications are closed? – Yes, but you will only be able to participate in the Achievement challenge. PvE Tournament: The Legends of Dalaran – Ulduar. In the taverns all across Azeroth a song can be heard, one song played by the bards, yet no one remembers the first one to sing it. It is heard around all over the place, but everyone knows the truth, it is an echo of our citizens, inside our memory, it will be spread in times of joy and fear. It is a Legend but there is nothing that proves it, and Legends may be forgotten or changed so the song will change too. We need to do something to keep the Legend alive, to remember each name and each feat, and this is how it is born: The Legends of Dalaran. All of us will remember some names, some families, famous for their strength, their passion or their victories, the truth will be constant for a while, but with time will only last as a rumor. The brotherhoods change and their leadership too; everyone is a storyteller with some dwarfish beer in their hand, but in Dalaran, there will be a special book. A magic book like our kingdom, where all those who made the bards sing, who destroyed all the enemies and were known for their bravery and power, will forever remain as Legends and be remembered with eternal glory. Our enemies are well known, every one of us knows how to deal with their threat, how to silence them week after week, but now everyone has the opportunity to show the rest why they are Legends and the rest only mere soldiers. To become a Legend you will need to fight against your enemies but also compete with your partners, the rest of the citizens of Dalaran. When the battle is big, the reward has to even be bigger. So your name will be remembered through generations in our world, Azerothian winds will whisper to the rest when you are close to them who are you, and what you did. The fame will surround you, not only by your titles, but also by your feats. If you want to become a Legend, to never be forgotten and always be known by everyone in Dalaran, where the children invent tales of your feats, where the ladies blush in your presence and the knights bow before you, this is your call. 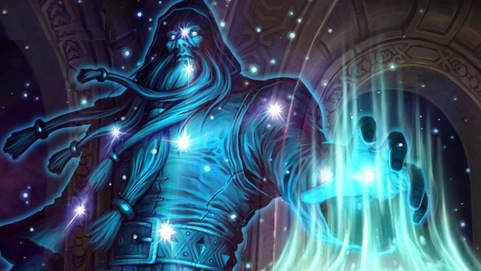 The Priests will bless your fate, the Mages will conjure your dreams, the Warlocks will slay your nightmares, the Paladins will grant you their light, the Rogues will murder your enemies, the Shamans will call the elements to your presence, the Warriors will respect your bravery, the Druids will whisper your history to the elders, the Death-Knights will plague your opponents and the Hunters will tame the wild for you. You will be known as the best of your era, and maybe of the rest of generations that you live with us. The books of our magical Kingdom of Dalaran are waiting to be written by you, our Legend. We are delighted to announce our plans to host for second time an unique event that has never been seen in the history of Private Servers – A progressive PvE Tournament: The Legends of Dalaran – Ulduar. From the beginning we have been searching for Legends who can achieve the impossible, and we tried to bring the attention of all the players we could, even before Dalaran-Wow was released. Now that we are known as dedicated, persistent and devoted people to our server and to our citizens, we can proudly host one of the most epic tournaments right before each tier/season ends. On Dalaran, not only the Realm Firsts that players have achieved will last, because there will also be Legends around, people known as the best. Eternal glory in our Kingdom awaits for you, and believe us when we say that the race will not be just based on luck. Your dedication, teamwork and partnership, must be better than the rest if you want to have any chance. We are currently searching for the Legends of Ulduar, but we will be searching for more in the future. Each of the eras will await for their heroes, and after that, they will await for their Legends. The idea was originally born of a suggestion from our Staff Member: Averdoom, and of a from the player Tygra (http://www.dalaran-wow.com/forums/community/pve/topic/2262/guild-raid-race suggestion) on the forums, about a possible guild race. After a long period of thinking about possible structures, performances and so on (always keeping our ideals and thoughts), Legends of Dalaran became true and is considered one of the great highlights from our server. This tournament will be hosted on our realm Algalon, it will not be game-breaking, and each and every one of the participants will have their reward. What do we plan to achieve with this? – To increase the competitive spirit among the players. – To bring the “hero feeling” to our players and to spread the competition to possible new players to come. – To be the one and unique private server with such tournaments. – To gain international and competitive PvE reference. – To become the heart and exclusive home of the PvE players. – To bring the most deep PvE experience in the private servers. – To have a centralized, unified and active community. – To bring a challenge to experienced players. – To advertise the server and to spread our quality around, in order to increase our popularity and grow as a unit. – To give fame and reputation to our players and guilds towards the World of Warcraft community. The PvE tournament will consist of two different races inside Ulduar and they will be present separately on both 10 and 25 modes. 1) Between 1st and 7th of May: First challenge – Speed Race. Once the Speed Race is over, the Achievement race will take place. 2) Between 8th and 14th of May: On the second challenge, the guilds will have to accomplish a list of achievements (that we will provide) in Ulduar. Each of the achievements will have a specific point value. The guild having more points between both of the challenges, will be proclaimed the winner. Will anyone be able to beat Obsidius guild, our Legends of Dalaran – Tier 7 winner ? – The Guild Master or one of the Officers must register their guild to the tournament. The registration for the Speed Run Tournament will be opened tomorrow friday, the April 24rd. **Note: Only those guilds who can have at least one player streaming via Twitch or recording everything will be eligible to participate on the tournament. We will explain through the forums everything, the table with the speed and achievement points value, rewards, rules, rewards, guidelines and so on. If you want to become a Legend of Dalaran, this Tournament is for you. All the gameplay footage was recorded in our server, with our scripts. Both trailers were made with all of our illusion. Our server trailer was made before Dalaran WoW’s release, with a concept presentation (https://dalaranwow.wordpress.com/presentation/) explaining our project, it was a really successful start and we managed to get a nice community through the blog, Facebook and Youtube even before the launch. The Algalon trailer, was made with the collaboration of some loyal players who started playing on Kirin Tor, our first realm. Thankfully, the start of Kirin Tor was great, the community thought that we were doing a nice job and that our content was of a good quality. Because of that, the release of Algalon realm was even more successful and we did reach more than 1.000 players online that day, a feat that could not be possible without the interest which was born after those two trailers and our constant and devoted work.